The way to create an ASP.Net MVC application in FastReport.Mono - Fast Reports Inc.
• A "battle" web server, for example, Apache. But this is if you are going to deploy an ASP.Net application. In our case, only the XSP server is sufficient for development. This is something like IIS Express, only for .Mono. There are a lot of articles on the Internet that demonstrate the installation of MonoDevelop and XSP, so I'll skip this. Let's proceed immediately to creation of the application. Choose ASP.Net MVC Project. The next step is to cancel the Include Unit Test Project. Next, specify the name of the project and the name of the solution, and select the project directory and click Create. Add libraries to the project in References: FastReport.Mono.dll, FastReport.Web.dll. Let's edit the controller for the HomeController.cs homepage. Our objective is to create a report object, upload a report and data to it. Let's take a quick look at the code for the Index page. First, we create an object of a web report. Then create the DataSet and load the XML database into it. After that, we register the data source in the report and load the report template into the report object. In the end, we pass the report to the view through ViewBag. The code is very simple - header and report. 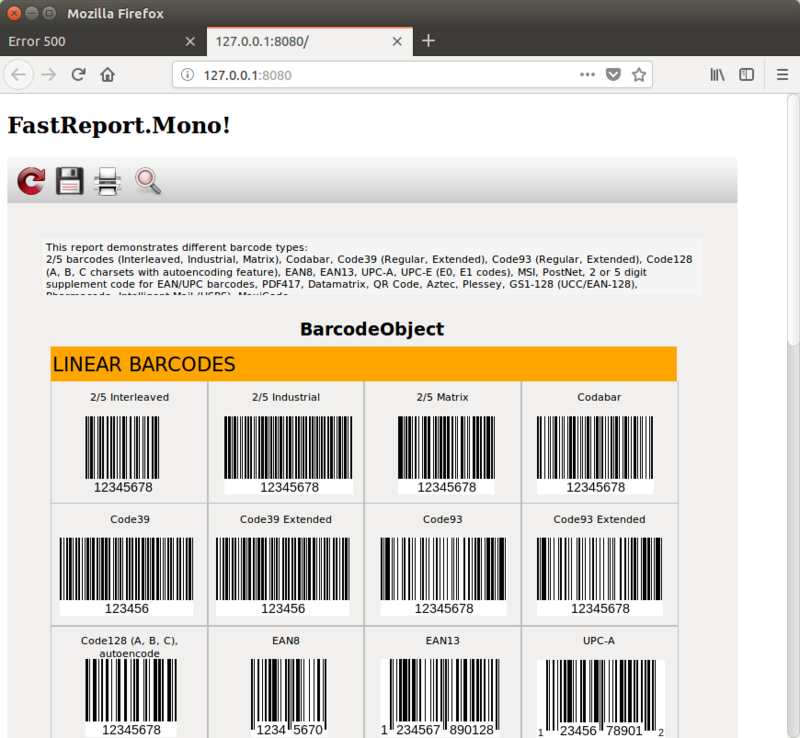 As you can see, the report object is exported to the HTML format for display. If you worked before with FastReport.Net, then for you there is nothing new in this article. The implementations in FR.Net and FR.Mono are almost identical.